Now you have bought a standing desk to try and avoid sitting disease, your feet and lower back hurt, your legs are swelling, and you are still tired. Who said standing was the solution? Standing is NOT the solution. As a matter of fact in the late 70’s there was a HUGE wave of complaints that played a big part of what started this whole “ergonomic workplace” storm in the first place. This is around the time they came up with the thick rubber mats, and foot stools for the line workers and checkout clerks. The information that standing for long periods is harmful isn’t new. It was just forgotten for awhile. The single solution to sitting disease is MOVEMENT. Or another way of thinking about it is – everything in moderation. This is the plain and simple truth to most everything (except breathing). How do you move around and exercise at work and still get your work done? 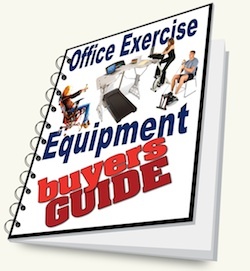 Exercise equipment that can be conveniently used with your standing desk are; treadmills, steppers, and seated pedallers. The first choice is a seated pedaller for a standing desk and gets 5 stars ★★★★★ for function, pricing, and versatility. The Stel’Air Seated Standing Desk Cycle JL-647 was made for high counters and standing desks. Now when you get tired and need to sit you can just flow into a new position and movement. On this comfortable padded seat you continue your work and start pedalling. After standing for a length of time blood can pool in the lower extremities. 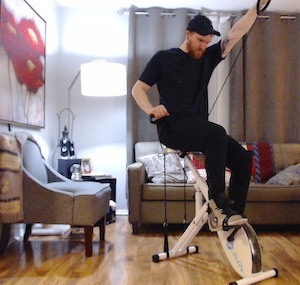 By pedalling you will be engaging the muscles again and pump the blood back into your body to be filled with new and fresh oxygen. This will help you stay alert, and burns more calories than if you just sat. 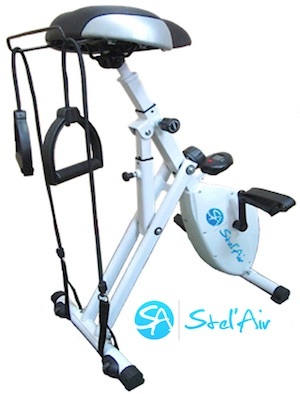 The Stel’Air Seated Standing Desk Cycle JL-647 will fold up neatly away for easy storage. There are also a couple of wheels on the back leg so you can bring your pedal chair with you when you have to attend long meetings. This bike is made for the workplace. Durable and made with quality. It is so quiet when you pedal that no one will hear you. The flywheel is balanced and enables 8 levels of resistance. 2 belts driven double axel with magnetic tension makes this a top quality durable option for office fitness. For the active workspace this seated pedaller offers well rounded versatility. User height recommendations are from 4’11” to 6’2″. At one time the only solution for the standing desk was to either lower the desk and sit or to just use a treadmill. Now you can sit, sit and pedal, or stand without having to adjust your table. 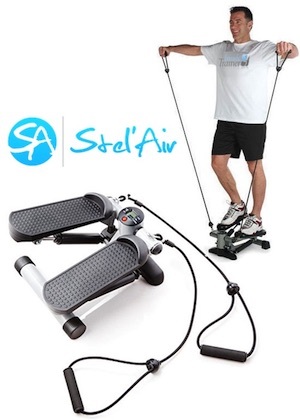 The Stel’Air Seated Standing Desk Cycle JL-647 also comes with exercise bands. Use these throughout your work day to help fend off the issues that come from working at a desk all day. Do the exercises to ease frozen shoulder, carpal tunnel, and improve the blood flow to the brain. These bands are a lovely feature for people who’s job restricts upper body movement during the day. Just a few minutes of upper body band exercises here and there can make a big difference. The seat is a foam filled broad seat to fit the buttocks of most users. There no back or side handles to restrict movement. There is a weight limit of 265 lbs. The mini stepper is the second preferred activity option that will work well with your standing desk. Although the stepper still keeps you in a standing position there are a few basic movements you can do that will engage your core (abdominal muscles) legs, and glutes – ALL AT THE SAME TIME! 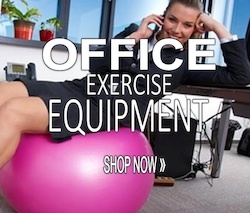 This fun little office fitness gadget is something you can get a lot of benefits from. Because it is small all you need to do is stuff it to the back of your desk when you aren’t using it. When you are ready to take a break from standing still and pump some blood through your legs, just pull it into place. They are lightweight and most weigh only 14 – 15lbs. The brand we recommend is Stel’Air because of its durable and quality made reputation and backed with a full year warranty. One minor drawback to using a stepper with your standing desk is the height. Standing on the stepper will raise you higher. However, you can use this to your advantage. By squatting slightly to keep your upper body lower and level with the table, you will really work your leg muscles. Alternatively, why not use the mini stepper at your standing desk to take an activity break? The studies show that it is a good idea to rest your eyes from the computer screen every 20 minutes, so why not rest your eyes while you work your legs? If you buy the mini twister stepper with exercise bands you will work your outer thigh, glutes, hamstrings, calves, abdominals, shoulders, back, biceps, triceps and more. –> Use the mini twister stepper at your standing desk and burn a whack of calories too. Using a walking treadmill with your adjustable height desk is becoming increasingly common among the upper management folks. They have the money and office space for this expensive piece of furniture. Unfortunately for them it still keeps them in a standing position even though they do move some. The walking treadmill isn’t designed to move very fast which is good so you don’t sweat in your work clothes. Walking is better than just standing in one place. The treadmills are expensive and they take up a lot of floor space. If you do want to have a walking treadmill for your desk, make sure it comes with the ability to incline as well to give you more aerobic benefits. There is one treadmill desk that will fold up and away when you aren’t using it that might be a great option for many people who want to have more options in their workspace. If you already have a treadmill desk then adding some other workplace fitness activities to your day might also be helpful.